Output 3.8.1 through Output 3.8.4 display the results of the analysis. The “Col Pct” values in Output 3.8.1 show the expected increasing trend in the proportion of adverse effects with the increasing dosage (from 18.75% to 71.88%). The corresponding mosaic plot (Output 3.8.2) also shows this increasing trend. Output 3.8.3 displays the measures of association produced by the MEASURES option. 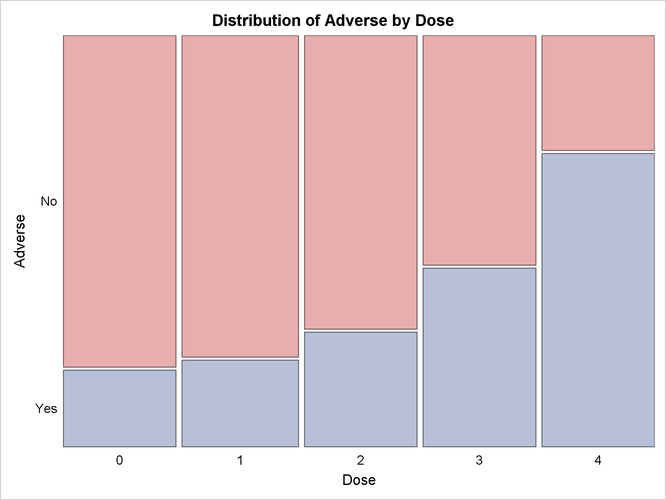 Somers’ measures the association treating the row variable (Adverse) as the response and the column variable (Dose) as a predictor. Because the asymptotic 95% confidence limits do not contain zero, this indicates a strong positive association. Similarly, the Pearson and Spearman correlation coefficients show evidence of a strong positive association, as hypothesized.